South American Guajiro Wayuu Mochilas are one of the most outstanding handicrafts of the Wayuu community.They are traditionally handwoven by women of La Guajira, in some cases taking up to 2 weeks for them to be completely woven.All of them are 100% handmade in Cotton Thread and are traditionally used as fishing net and personal use item carriers. 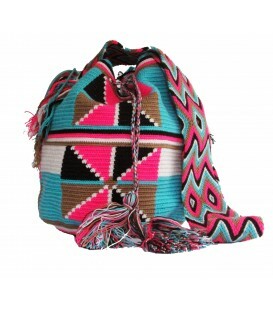 Mochila Patterns simbolize elements of the tribe´s natural surroundings . 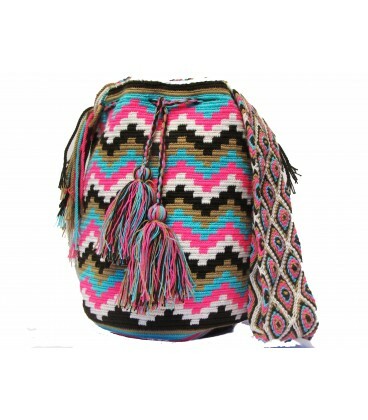 Desertic natural landscapes and animal imagery of La Guajira are symbolically embeded in each mochila pattern.It is common for indigenous handicrafts to include elements of animal and natural imagery with symbolical cultural relevance in its motifs.